One ferry on the popular route went in for routine maintenance, then its backup suffered a “massive engine failure.” So, enter the state’s $123 million, brand-new ferry, the Chimacum. 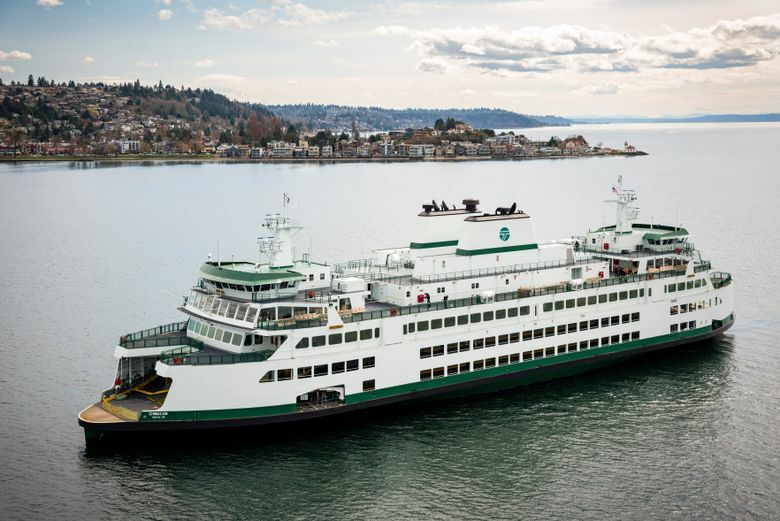 A “massive engine failure” on the regular backup ferry for the Seattle-Bremerton run prompted Washington State Ferries to turn to its sparkling new vessel, the M/V Chimacum, as an emergency substitute early Wednesday, a state ferry-system spokesman said. The 144-car, 1,500-passenger Chimacum — accepted into the state’s 23-ferry fleet from its builders last month — fired up its engines for operations on the popular commuter route beginning at 6 a.m. at Seattle’s Colman Dock, said spokesman Ian Sterling. “We were able to activate the Chimacum about a month early to have it swoop in to save the day for the holiday week,” Sterling said. Typically, two ferries serve the Bremerton-Seattle run — the Kaleetan and the Hyak. With the Kaleetan in the shop for routine propulsion maintenance in anticipation of its annual Coast Guard inspection, ferry officials expected to tap the M/V Kitsap — the run’s regular substitute — as a fill-in, Sterling said. Enter the Chimacum. The $123 million ferry had been gearing up for a late June debut — in time for the busy summer season. But with crews trained for the vessel, and sea trials achieved, the ferry is ready to operate, Sterling said. “The timing just happened to work out,” he said. The Chimacum is expected to serve as a substitute on the run at least through the end of the week. Once the Kaleetan passes its inspection and is ready — possibly as early as Friday, but more likely, early next week — it will be put back into service, Sterling said. In the meantime, the final touches will be put on the Chimacum before it returns to the water in late June. It will allow state ferry officials to place the Hyak into a service relief position and to retire the aging M/V Klahowya, Sterling said. As the third “Olympic Class” ferry in the state’s fleet, the Chimacum provides flexible seating configurations, wider vehicle lanes and two passenger elevators, “making it the most accessible vessel in the fleet for passengers with disabilities,” according to information on the state transportation department’s website. The new ferry has enough life rafts to accommodate all passengers — a significant upgrade that will mean better service after big events, Sterling said. Ferries now on the run have only enough life rafts to accommodate half the passengers at full capacity, Sterling said. During daytime operations, the Coast Guard allows such operations because the ferry system has other boats that can assist those vessels should problems occur. That won’t happen with the Chimacum, he said. Still, the new ferry isn’t quite finished.